Have a look at these fabulous herb gift ideas for under $25. You'll find something for everyone here, from single serving herbal tea infusers, through herb growing kits to a herb drying rack. A fabulous selection of thoughtful herb gift ideas for friends and family. By the magic that is Amazon, if you click on these links, you'll be taken to your local Amazon and will be shown either the same or similar product, depending on availability. 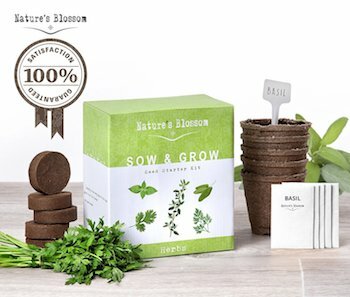 What a fabulous gift for someone who loves herbal tea - a grow your own tea kit which will be greatly appreciated by a herb lover. Lemon Basil, Mint and Bee Balm make lovely teas. 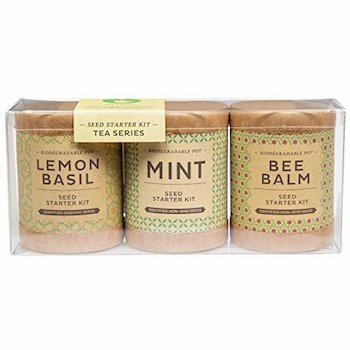 Mint is very soothing for digestion, Bee Balm has a wide range of uses from relieving anxiety to flatulence and Lemon Basil for its anti-inflammatory and anti-bacterial properties. These great containers are biodegradable, so when it comes time to transplant outdoors or into bigger pots indoors, you won't need to disturb the roots. One of my favourite herb gift ideas. 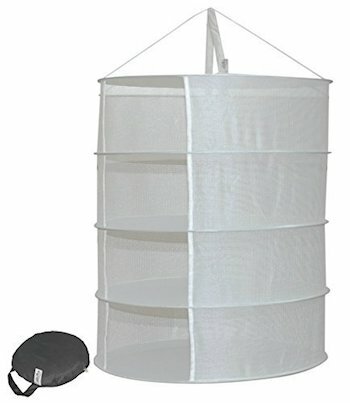 This is an amazing fresh herb keeper. It's big enough to keep several different herbs in and ideally shaped to go in the refrigerator. 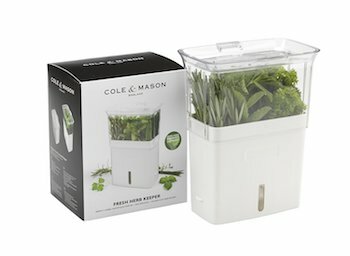 It has three dividers to help separate your herbs if you want to and a little window at the bottom allows you to see how much water's in there. A great gift for the cook who loves to use fresh herbs as it will allow you to keep them for a couple of weeks. Fresh cut herbs are expensive, so anything that extends their shelf life has got to be good. 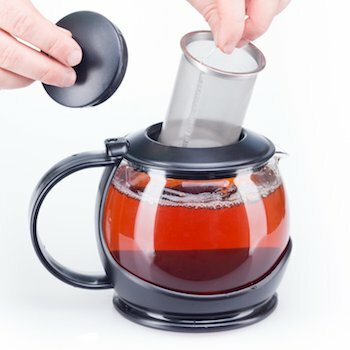 What a fabulous product, an ingenious way of brewing herbal tea (or any loose leaf tea) for one person. This large ceramic cup is double walled for insulation, it's got a little stainless steel basket inside for the herbs to go in and a lid to keep the heat in and stop the volatile oils escaping. This is a really great gift and it's under $25 so you could pop in a box of herbal tea and still have change. Any tea lover would be thrilled to receive this. Great choice of pretty designs too. What a stunning design - a handblown glass tea pot with a stainless steel insert. This oozes class and is such a beautiful gift. There is a zip on black tea cosy which is washable. It's big enough for 4 to 5 cups. One of the advantages of having a glass tea pot is being able to see when the colour changes and judge when it's brewed properly. This gift would be great for a wedding present, engagement, birthday, house warming - anything, I can't think of any occasion that you couldn't mark with this gorgeous tea pot. A great design for making herbal tea to take out or make tea at work. 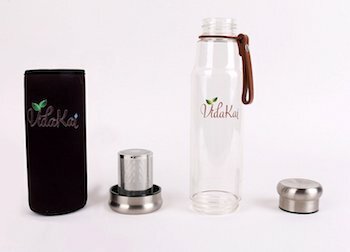 The infuser fits into the bottom and there is a lid for the top. This means that your lovely herbal tea will brew and the volatile oils won't escape. It's very inexpensive (around $18) but looks so classy - would be good at the yoga class or at the office. It's also good for cold drinks, so in the summer you can make up herbal teas to drink cold or use it for sun infusion. 150 different trees, shrubs, climbers, perennials, vegetables and fruit which are particularly good food for bees and other pollinators. 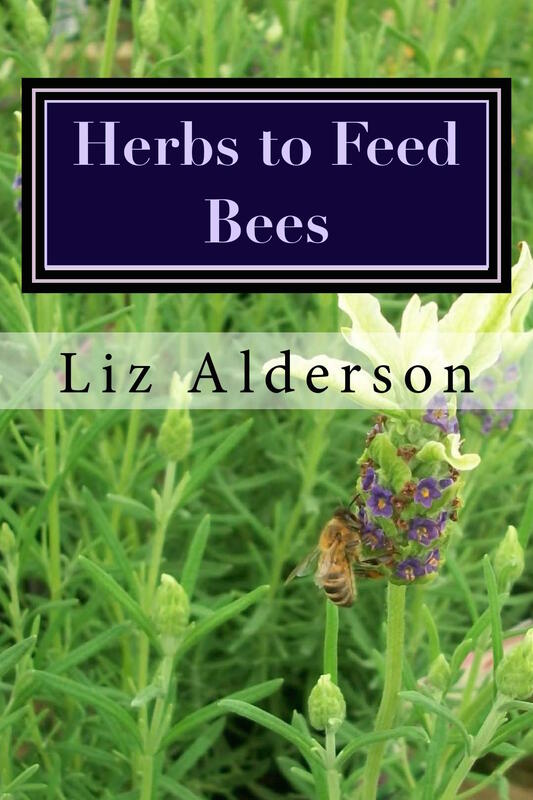 Available in paperback or Kindle, this will be a great gift for any gardener, conservationist or people who are teaching their kids about plants and the ecosystem. This amazing kit has all the things you'll need to grow five different culinary herbs. Basil, Thyme, Cilantro, Parsley and Sage. All the herbs you'll need to cook some great dishes. Fabulous for getting the kids involved in growing, harvesting and cooking. 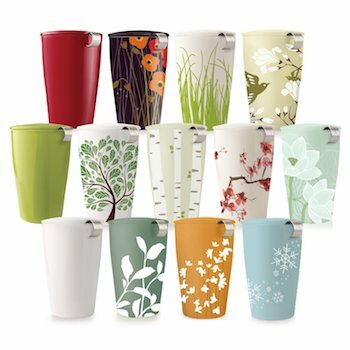 The pots are biodegradable and so you'll be able to pot on or plant out without disturbing the roots. A fabulous gift for under $20 and there's a 100% satisfaction money back guarantee. What a great gift for any herb lover and gardener. So much space on those shelves to dry herbs, flowers and anything else you want. It's collapsible and the little black bag you see at the bottom of the picture (not to scale) stores it away neatly when not in use. Beware - it snaps into shape when you unzip it and it might hit you in the face if you're not careful! This solves a lot of problems for finding somewhere to dry herbs - forget struggling with oven drying or finding space to hang bunches up around the house - it's awesome! A good 24" diameter and four shelves gives a lot of space for drying. 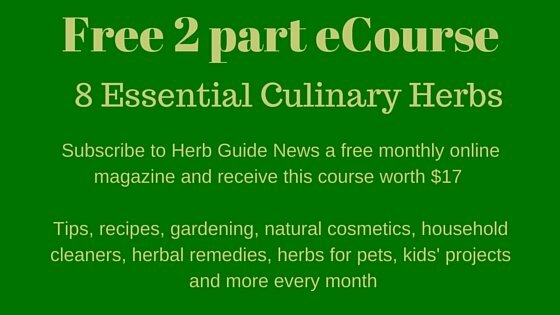 If you're wanting herb gift ideas for the herbalist in your life, then this would be perfect. What a novel idea to grow five herbs in this terrarium. Comes complete with seeds for growing Sage, Basil, Parsley, Cilantro and Dill - perfect for culinary use and some cosmetic and medicinal uses there too. The dome will act as a mini greenhouse, keeping the seeds at a constant humidity whilst they germinate and get established. Keep harvesting them so they maintain a neat shape - when they outgrow the terrarium, move them on and start again with another batch. It's a fascinating hobby to watch herbs grow indoors. If you're looking for herb gift ideas for kids, this would be just great and would help them learn about growing herbs. 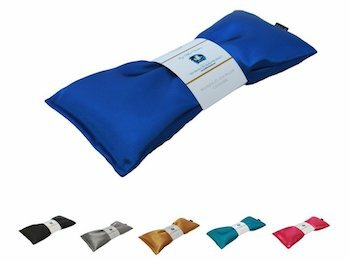 If you have a friend who suffers from headaches, migraines or insomnia, then this lavender scented eye pillow might give them some relief. 93% of the review on Amazon are five and four star - people are singing its praises. It has a soft cover, delicate scent and is filled with organic flax seed - all made in the USA. You can use it as hot or cold therapy. Keep it in a polythene bag in the freezer or mist it with water and heat in the microwave for 30 seconds. People respond differently to hot or cold depending on their personal preference. There's a range of colours to choose from and it's a really thoughtful present - or it may be the answer for your own problems. This is a fabulous gift for a friend who would like to grow herbs but has bad luck with keeping them alive. 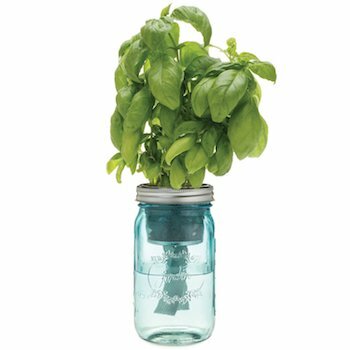 You plant the organic basil seeds in the growing medium and the wick dips into the water. The plant never dries out and you can see when you need to top the water up. Ideal for people who 'forget' or go away frequently as the herbs will keep healthy. There are three others in the range, parsley, oregano and cilantro. It's a very stylish looking mason jar which would grace any kitchen. The growing medium is recyclable, just rinse it all through, clean the mesh container and the jar and you're ready to go again. This has to be one of the best herb gift ideas I've seen.